Editor’s note: See related audio report where two guests from opposing sides join Current State to update the wolf debate. Michigan conservation groups and the state’s Natural Resources Commission are debating how a Michigan wolf hunt will affect the health of the wolves, ecosystem and people. Michigan wolves, numbering less than 1,000, were taken off the Michigan endangered species list in December. Michigan Gov. Rick Snyder signed a bill allowing the state to create a wolf-hunting season. The grey wolf and the Eastern Timber Wolf were once both included on the federal endangered species list. Both wolves are considered a game species in Michigan, although the Michigan Natural Resources Commission has not yet decided on a season. A conservation group called Keep Michigan Wolves Protected aims to defend the remaining wolf population. “What we are trying to do is to keep [the wolves] on the endangered species list, or at least the threatened species list,” said Pamela Graves, a veterinarian in Petoskey, Mich. There is minimal interaction between wolves and humans, Graves said. If they threaten livestock or deer, a hunting season should be considered. Otherwise there really is no advantage for the ecosystem if wolves are hunted. The Michigan Department of Natural Resources is surveying the wolf population and will recommend to the Natural Resources Commission if a hunting season is needed to control them, Boulder said. The results from the survey will be released by late April. Part of the decision is made by looking at where people and animals have been threatened by wolves. People and livestock are more commonly threatened in the upper peninsula of Michigan than the Lower Peninsula. In 2012, grey wolves and Eastern Timber wolves were removed from the federal endangered species list, permitting states to decide if it was appropriate to add them to state endangered species lists. Both Minnesota and Wisconsin have established hunting seasons, and now Michigan will have a chance to join. No other Great Lakes state hunts wolves. Minnesota’s hunting season started in fall of 2012 and ended Jan. 3, said Minnesota Department of Natural Resources large carnivore specialist Dan Stark. During the hunting season, 413 wolves were killed. In Minnesota, a wolf hunting season is consistent with how the Minnesota Department of Natural Resources manage other species that involve hunting and trapping, Stark said. If an official hunting season were to be established in Michigan, one of the main reasons for the season would be controlling wolves that threaten people or livestock that have been threatened by wolves, Boulder said. Last November, hunters in Minnesota with rifles in tow took up hunting wolves after a hunting season was established. 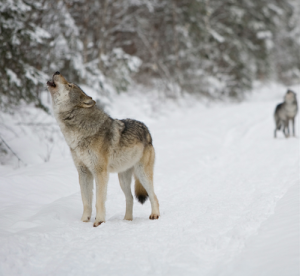 Minnesota targets a harvest rate of 400 wolves per season. The number of wolves has remained at a steady 3,000 for the last ten years, according to the Minnesota Department of Natural Resources. Wisconsin had a wolf hunting season for the first time last year. Michigan, Wisconsin and Minnesota are a part of the distinct wolf population segment, meaning all three states are exempt from the Endangered Species Act. I love reading the comments from people who want to use a referendum to trump what he DNR biologist know about these animals. Most of the people making comments about the wolves think they are experts because they own a wolf calendar. FYI: “Silencing Voters in Michigan” – many interesting comments posted to an item at The Wildlife News–some with a Northern Rockies perspective, where our own wolf persecution plays out. “My bill, if this passes, goes at it a different way,” Casperson said. “We’re trying to address this thing, that the ballot initiative takes away the will of the people.” Takes away the will of the people by having a statewide Ballot on the issues. Doublespeak at is best!!! Congrats to Senator Casperson for having issues cooked and served to his liking. The idea that we need to “manage” wolves in their natural environment lacks credibilty, especially if that “management” is through a shotgun-approach hunt. When wolves attack cattle and livestock, the DNR is already authorized to kill those problematic wolves, as it should be. We don’t need a non-specific, wholesale hunt for that. Some reports indicate that the wolf population in the U.P. is already stabilizing or even experiencing a slight decline. The scientists who have studied predator-prey relationships of moose and wolves on Isle Royale are opposed to a wolf hunt in Michigan at this time. It seems that if we want to make science-based decisions, if nothing else, a wolf hunt is premature. WE are apex preditors like wolves, left unchecked the population of wolves will eliminate the natural food supply and will prey on whats easy for them, cattle, sheep, dogs,cats. I love the idea of hunting deer along side these wonderful animals, but the reality is they must be managed like any other game animal in the natural environment. Mondern humans like to try and seperate themselves from the wild it is easy to do when your next meal is as close as the refigerator, but I prefer to take responsability for were my food comes from, taking my place in natural world, like the wolves I respect so much. Wolves kill few livestock in Michigan (less than 1%). Wolves do not pose a serious threat to humans (no human deaths by healthy, wild Wolves in the lower 48 in over 115 years)and have a beneficial effect on ungulate herds and the environment. Ranchers and property owners already have the right to kill Wolves that threaten their property or animals. Ranchers are reimbursed for Wolf confirmed killed livestock 100% and can have the state trap and kill problem Wolves. There is no scientific or moral reason to indiscriminately kill (hunt) Wolves. Those that favor Wolf hunting (sport and trophy hunters) are only interested in doing so because of their brutal, savage, archaic blood lust and so that they can add some dead animal parts to their mancave collection. Reprehensible, despicable, evil activities perpetuated by immoral, unethical humans. How about heavy snow cover in the UP and the northern part of lower Michigan which, when heavy, accounts for starvation? If deer populations are down there are other factors involved besides the wolf. Does the DNR still have a Spring count to see how many died over the winter? Senator Casperson, who does not like the fact that the state’s voters can sign a veto resolution on the legislation he forced through making wolves a game animal, now plans to override the voters with his Senate Bill No. 288, which will identically add wolves to the game list as the bill the voters decided to suspend until November 2014 did, allow the NRC to designate any animal they want a game animal (however, they are prohibited from removing wolves from the game list without the permission of the legislature, which Senator Casperson can make sure they never get), appropriate a token $1,000,000 for NRC expenses that will have the effect of making it impossible for Michigan voters to sign a veto resolution on his new bill. What a slimeball. How do we get this incredible piece of work out of the senate resources committee and end the damage to responsible legislation he’s causing? The DNR’s claim to limit the take of wolves to those packs that have a history of conflicts is weak. The zones contain numerous packs of wolves that have no history of causing any trouble. We want our hunting season to save our deer. Wouldn’t you consider MN and WI as Great Lakes states?